Gordon Dowsley has worked on international development in many countries around the world since 1993, including many plagued by land mines. His field is financial sector development in countries transitioning from communism to free market systems and also in developing countries. He taught at Moscow State University while stationed there for two years. He also was at the World Bank group in Washington for 3 years. His projects have been funded by a variety of groups including the World Bank, UN, USAID, IMF, European Union and Asian Development Bank. He had previously been Vice President, Financial Reinsurance at The Crown Life Insurance Company in Toronto. He has been a Delegate from Canada to Liberal International conferences, a member of the Board of Trustees at Queen’s University, and a board member of the Canada Council for the Arts. He was also Chief Registered Agent in Ontario under the Elections Expenses Act for the federal Liberal Party. 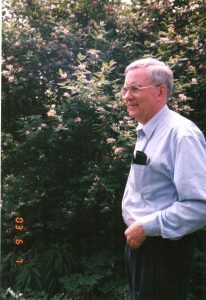 He was the recipient of a Paul Harris fellow by the Rotary Club Moscow International; a member of the group that start National Carnation Day for the Multiple Sclerosis Society; an original member of the Japan Society; chair of the Friends of the Ontario College of Art & Design; instigator of a sculpture garden, and was also involved with the Fields Institute for Mathematical Science. Special functions he organized abroad include a gala evening in Kabul for the National Gallery and a day at the ballet for the orphans of Ulan Batar. Gordon and his wife Marilyn have three daughters and five grandchildren.